“My tummy grumbles for that!” my youngest son said as he pointed to the jar of Granola I had made on whim the night before whilst he was tucked up in bed. 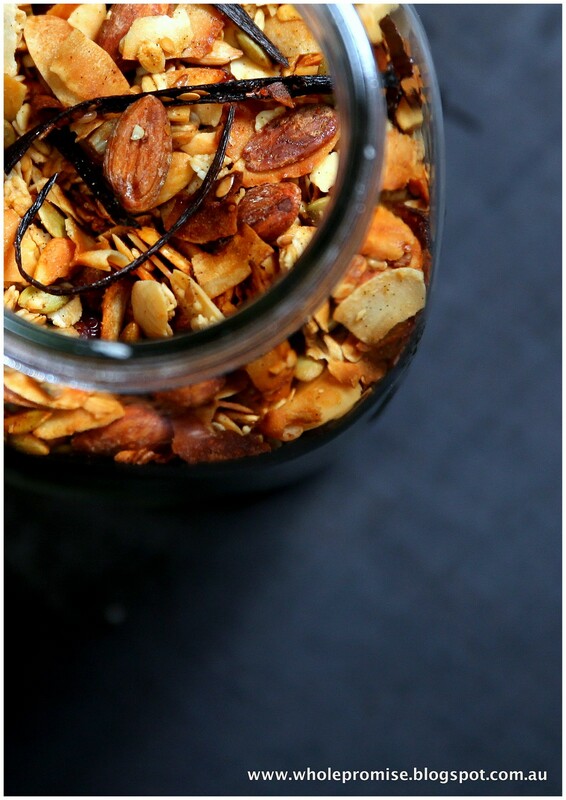 There’s something nice about a big glass jar of granola sitting perched on the kitchen counter - don’t you think? I’m not sure what it is? 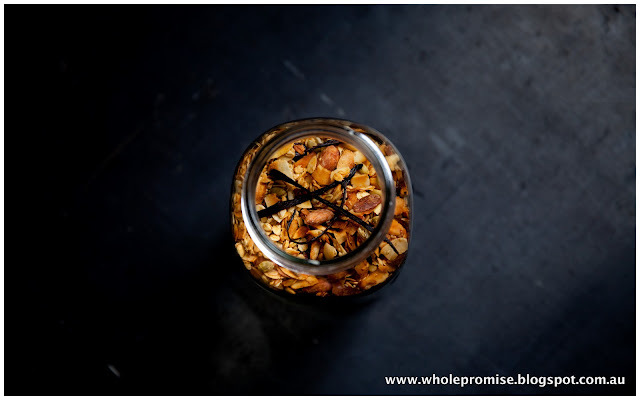 It’s probably linked to my obsession with food and lifestyle magazines who feature perfectly styled kitchens with a big jar of perfectly roasted golden granola on the bench top. 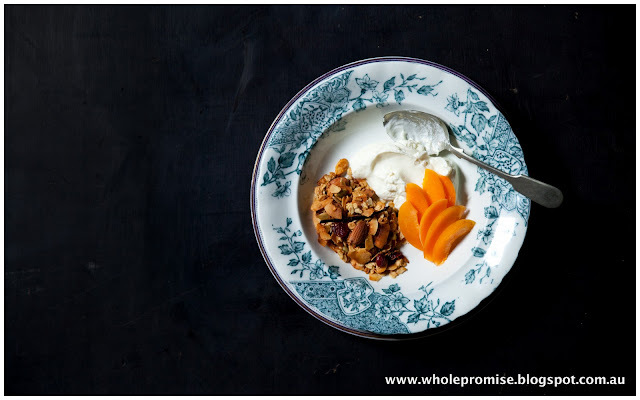 The granola I can achieve, the perfectly clean kitchen - no! Well, maybe for five seconds once a week. Search the web and you will find a zillion trillion recipes for granola. It’s nothing ground breaking but it’s popularity is definitely warranted for its taste and versatility. My version here mingles mesquite powder with dried cranberries, shavings of coconut and plenty of seeds. Mingled together this combo made a delicious mix of golden crunchiness which looks nearly to good to eat. 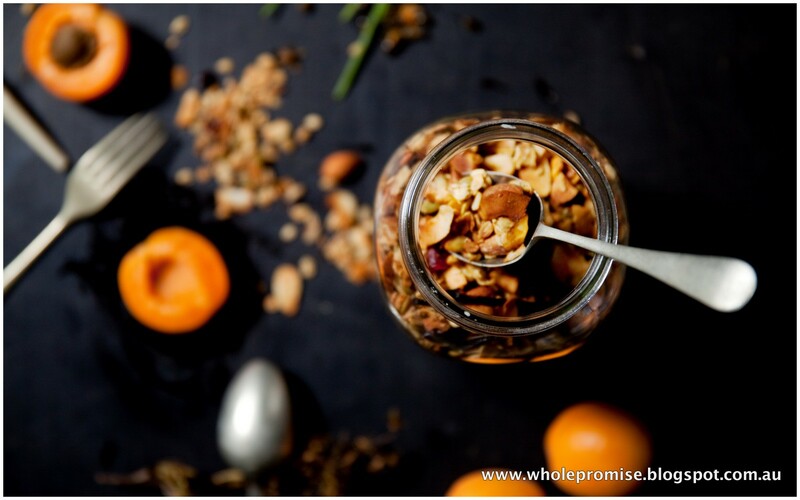 Granola can be enjoyed in so many ways. 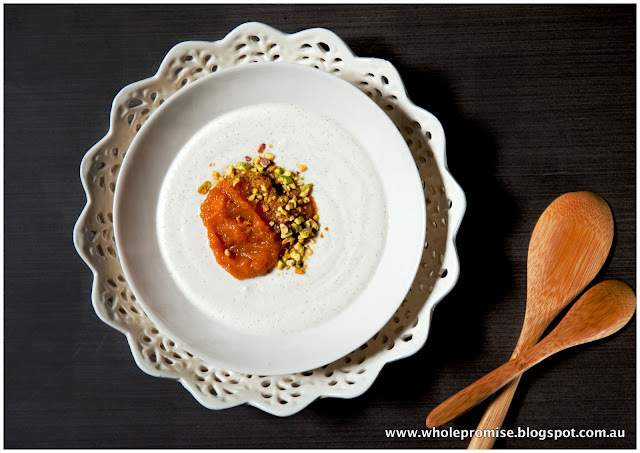 1/2 cup with a splash of almond milk/goats yoghurt and fruit or with this cashew cream serves me beautifully each morning. It works pretty nicely as a snack as well. When nicely golden and evenly roasted remove from the oven and allow to cool before finding your own special jar to perch on your counter. Breakfast is by far my most favourite meal of the day. It’s the meal that I am always most hungry for, it’s the meal that sets my day and it’s something that I always allow time for. I am definitely not one of those people who can eat the same thing for breakfast everyday, day in, day out - no way. I like mixing it up and tend to go through phases, usually directed by what is in season or by what I feel like. For those of you who know me well I am a huge fan of local food, farmers markets etc. I drag my two boys along to our local one at the crack of dawn pretty much every Saturday morning - rail, hail or shine. Once upon a time the boys would complain, but now on a Friday evening when putting them to bed their last words usually are “see you in the morning for the market”. It’s music to my ears. On the weekend I met for the second time this couple who had a selection of hand crafted raw goods on sale. Swoop I did, and came away with a few packets of their raw crackers and their version of what I have prepared here. My mum and I shared it, and with our last mouthful agreed we would have a go at recreating it. My version uses rice malt syrup meaning it’s not 100% raw but hey, that’s cool because it tastes super yummy and is dairy, gluten and grain free. It’s not as good as good natured living’s but I don’t have access to them every day so this will have to do for now, and with persimmons coming into season here I will be making this one again some time soon. 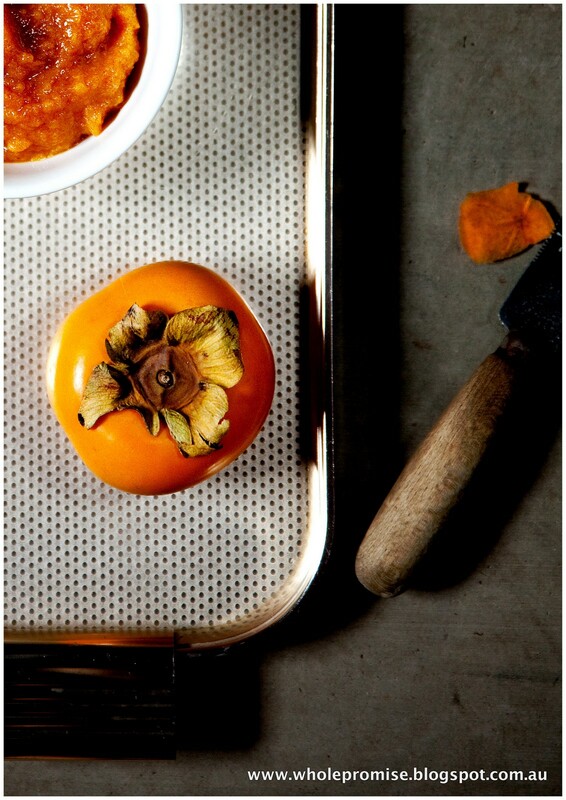 Peel the persimmon and place in a high speed blender along with cinnamon and coconut water. 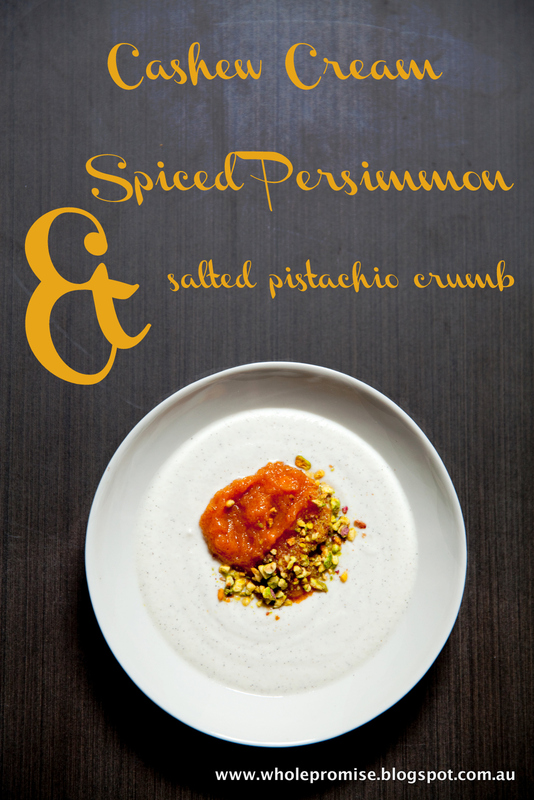 Spoon cashew cream into a bowl and top with spiced persimmon and pistachio crumb. My photography assistant below is also very good at helping himself to whatever is in view of the camera. 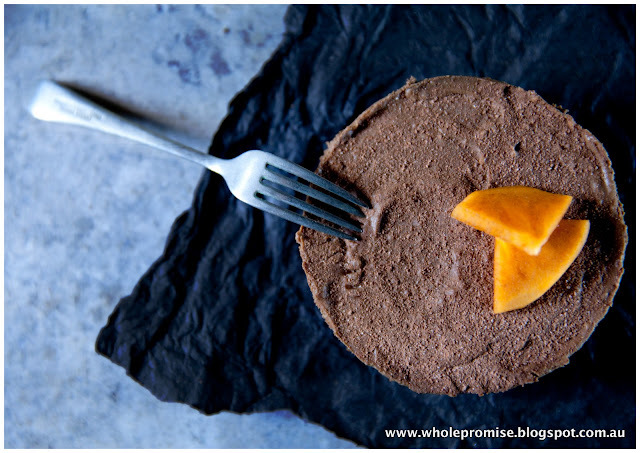 I absolutely agree with Martyna from Wholesome Cook on this one - yes, a cheesecake can be both delicious and good for you. 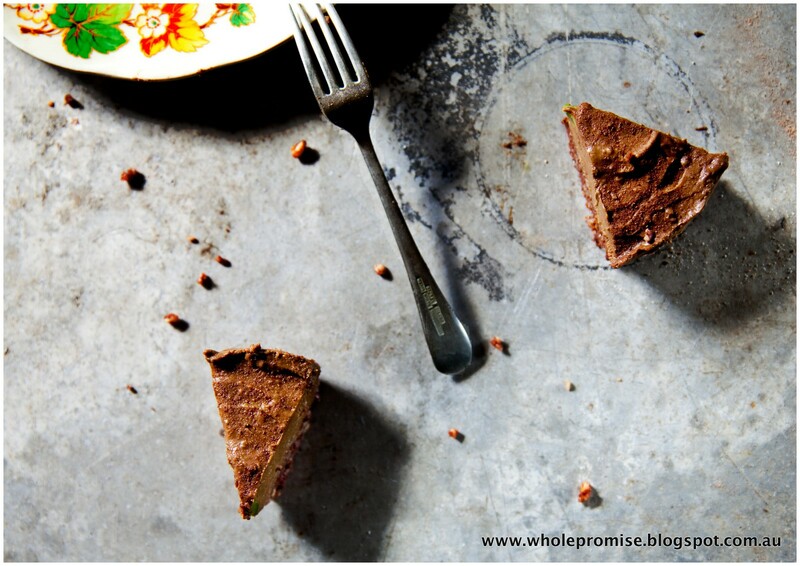 When a copy of Martyna’s new e-book - Guilt Free Desserts landed in my inbox it was this recipe that I kept flicking back to - Peanut Butter & Chocolate Cheesecake. Impressive to say the least this not so traditional cheesecake utilises one of my favourite ingredients and turns it into a star. The use of avocado here creates a moorish dessert that is also no bake and dairy free provided you can get your hands on some vegan chocolate. Me personally, I just went with regular organic chocolate. What could be more perfect, right! Included in the book is also a host of other food bloggers who specialise in whole food and allergy friendly cooking and Wholepromise is part of that with its “Macadamia Cacao Icecream”. We were so excited when Martyna asked us to contribute. 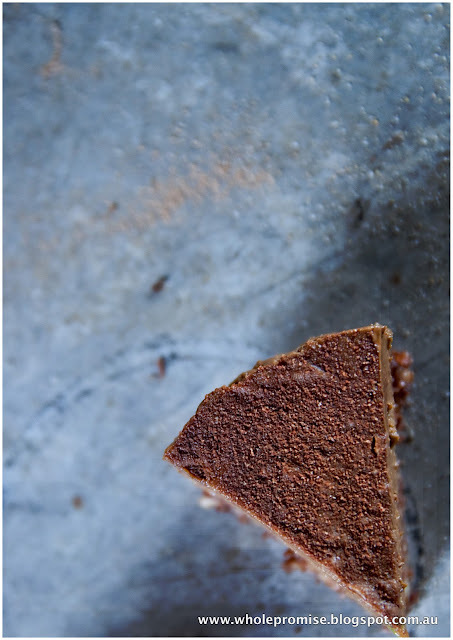 If you haven’t got your hands on your copy of Guilt Free Desserts then skip on over to Wholesome Cook right now to pick up your own personal copy and brace yourself for some drool worthy recipes that are minus the guilt yet still full of pleasure. Perfect timing for Easter I would think. 1. Process pecans in a food processor until roughly chopped. Add the remaining crust ingredients and process further to combine into a moist crumbly consistency. 2. Spoon crust misture over the base of the tin and spread out evenly, pressing the crust down firmly and into the edges of the tin. 3. Place tin in the fridge for 10 minutes for the crust to set. 1. Place all ingredients (except for the melted chocolate) into the bowl of a food processor or your handheld blender (chopping attachment). Process until smooth and creamy. 2. Add melted chocolate to the avocado mixture. Process until smooth and well combined. 1. Remove the ‘cheesecake’ from the freezer about 10 minutes before serving (shorter in summer, longer in winter). Slice and serve. It’s been bucketing down here with rain for what seems like weeks now and outdoor plans and activities have been on hold. Each morning we wander if we will ever see the sun again. On a positive note however, the dull weather has provided some beautiful light for photography and I have enjoyed watching it dance on my subjects as I snap away and learn more with each and every click. The boys usually join me and think it is funny to help themselves to whatever I am capturing. 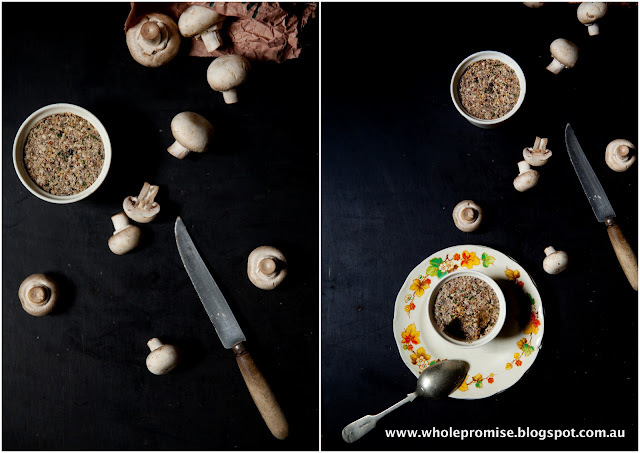 Who am I to say “no” when it is something that contains mushrooms, nuts and other yummy things. Shame they wouldn’t eat it if I put it on a dinner plate for them at 6pm each night. 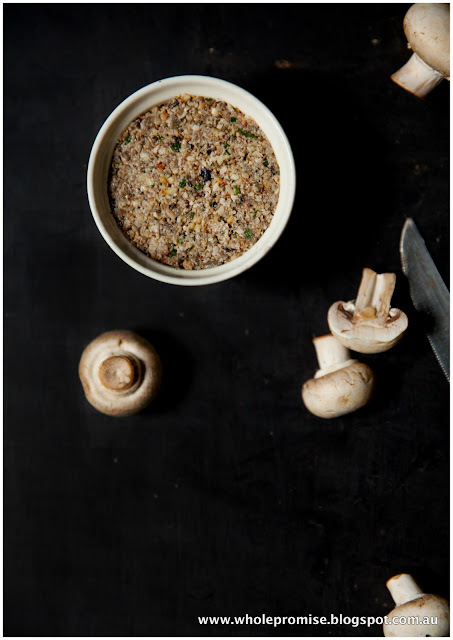 This mushroom pate exceeded my expectations, is vegan and makes for a yummy afternoon snack. Place in the fridge for a little while to chill and serve as you wish. Below is one of a zillion photos I have taken in the last couple of weeks. With a new venture in the pipe line I am slowly collating what I need to make it happen. I just wish I wasn’t one of those people who wants everything yesterday. Can you relate? 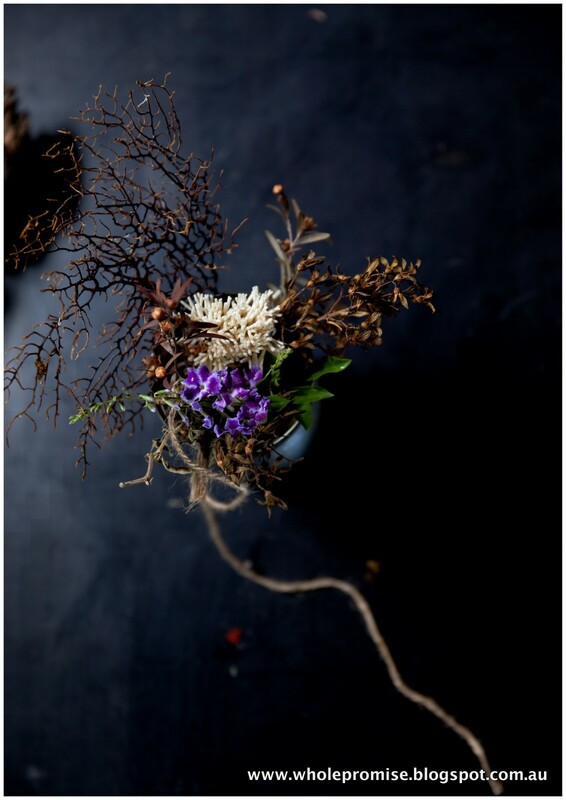 Loving the little shot of purple (stolen from my neighbours garden - sorry) in this photos. With the weather having been as such it is quite possibly the brightest thing I have seen in weeks. 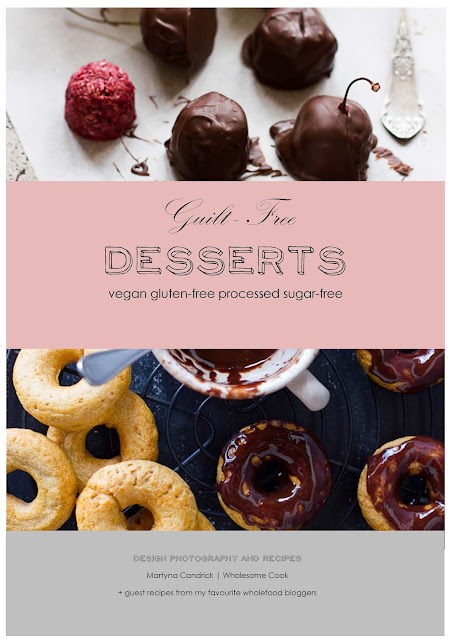 Flick The Guilt For Just $15 By Picking Up A Copy Of Guilt Free Desserts By Wholesome Cook Today. Did I Mention We Are Featured! 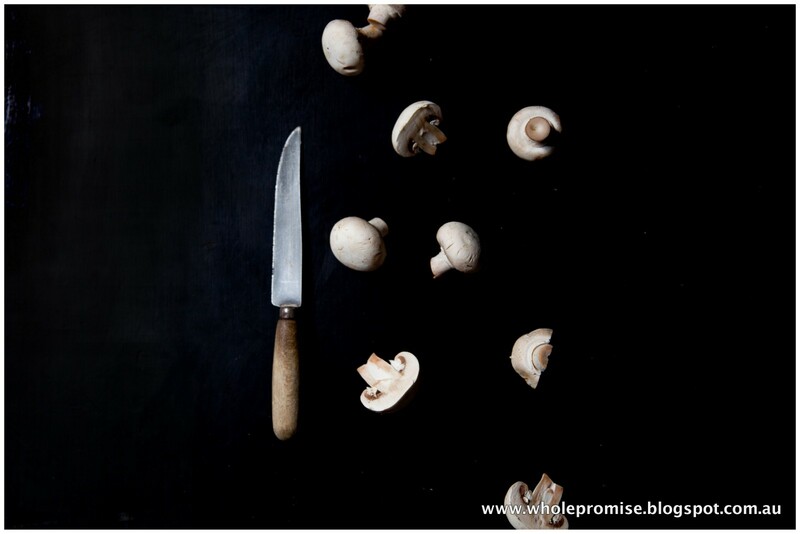 Hey There, I’m Sherilyn the creator of Wholepromise. 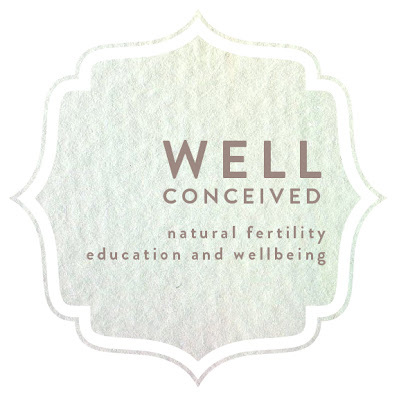 This is where I venture outside of being a mum, wife and Fertility Nurse Specialist. I live on the Sunshine Coast in Qld, Australia and am spoilt by year round access to Farmers Markets offering a plethora of local, seasonal and organic produce. 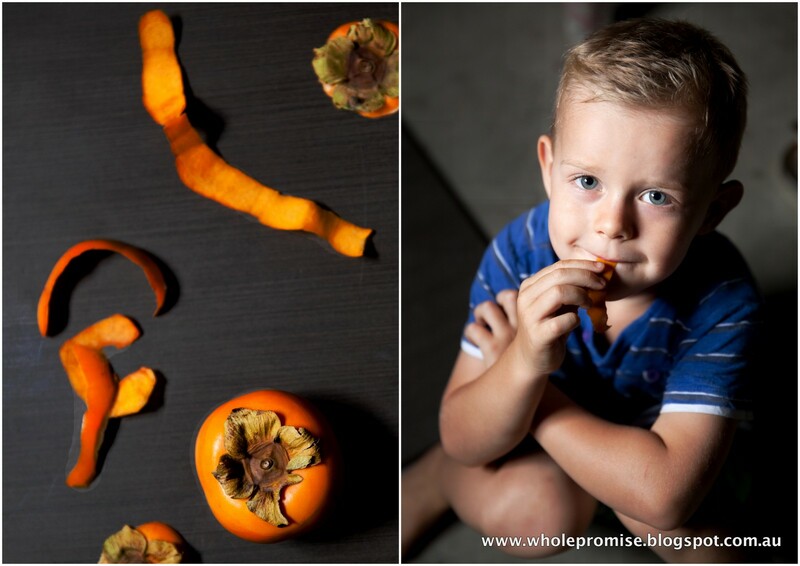 In all Wholepromise is my style of food, it’s the food I want my boys to appreciate and it’s the food that makes me happy. Styling and photographing it is just another bonus. Wholepromise © 2012. All Rights Reserved.